How does a song become "our song"? Can a song be a prison? Years ago I saw Tom Waits play at the Paramount Theatre in Seattle. The tickets cost ninety dollars, which was half of what I had in my bank account, but I never really considered not going. It was winter and I was driving an old pickup truck with no heat. I didn't know anyone in Seattle, so I had to drive up to the show and drive home after it, a round trip of six hours. Somehow he played song after song that I didn't really want to hear. I kept thinking, "This song? Really?" Every goddamned song was like that. The band sounded great and it was nice to be in the same room as Tom Waits, but as the set was nearing its end I hadn't heard a song that killed me, which was strange because most of his songs kill me. He finished the set without playing any songs on piano. There wasn't even a piano onstage. The crowd cheered for an encore and he came back out and played three more songs. Again, none of them were my favorites. This seemed like staggeringly long odds, that an artist I knew and loved so much would play so many songs I wasn't fond of. He finished the encore and the crowd cheered again and I sat there thinking, "I spent half of my savings on this and drove up here in a cold truck, and if he doesn't come out for a second encore, I'm going to have get back in that truck and drive three hours to Portland, where I have neither work nor money." Along with hundreds of others, I screamed for him to come back, wishing so hard that they would bring a piano out and he would play a song that I loved, knowing that at any second the house lights might come on and the show would be over. Two stagehands wheeled out an upright piano and I started to cry. Tom Waits played "Hang Down Your Head" and I sang along with every word. I was fine with driving home three hours in the cold to a place where I had nothing. I was fine with everything. I got to hear one song I loved. Years later when I met Rachel I found out that she was at that same show with her then-boyfriend. They weren't getting along and she spent most of the night arguing with him in the lobby of that beautiful theater. On the day of my thirtieth birthday I was too sad to answer my phone so I drove out to the coast by myself. I wandered around until I discovered the Columbian Cafe in Astoria. I sat at the bar while Uriah, the owner, a very Jerry-Garcia-looking man, cooked up different experiments. "Here, try this," he would say as he handed me a corn blini or a piece of roast duck dancing with flavor. I decided to order the red snapper, and he served it to me with a sliced-up tomato on top. I had never really enjoyed raw tomatoes. Not that I hated the taste, but for some reason they always made me gag. By the time I would finish a salad or something, my plate would be filled with little leftover tomato wedges that I had pushed aside. However, as Uriah handed me the plate of red snapper and tomato, despite thirty years of evidence to the contrary, I decided to eat it. I trusted his kind face and the loving way he cooked everything. 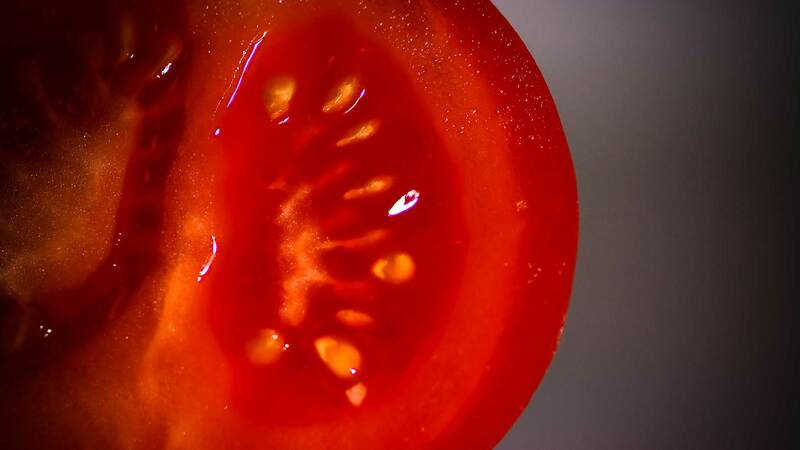 I trusted the deep red of the tomato, the kind of red you only see when you cut a vein and blood comes spilling out. I ate Uriah's tomato, and it changed everything. It made me mad at all the pale pink tomatoes that were, at that very moment, being shoved dispassionately into sandwiches and burritos. In the Allegory of the Cave, Plato describes how we never know the true essence of something, we just know the shadow that it casts on the wall of the cave in which we're all chained. I swear to God that in Astoria on my birthday when I bit into that tomato at the Columbian Cafe I walked right into that cave, grabbed the tomato that was casting the shadow of tomatoes all over the world and took a bite out of that. It made me wonder how often in my life I had settled for the shadows. I wanted to find more real tomatoes. I don't know how a song goes from just being a song to being "our song," a song you share with someone as a kind of lifelong secret. For me and Rachel that song was Waits' "All The World Is Green," but I can't remember how it became that. Ideally a song becomes "our song" in a magical moment when it comes on the jukebox and you just sort of naturally claim it together and it always reminds you of the other person. The only time anything so immediate has happened to me I was at Aunt Tiki's on Decatur with Leah and there was no one else there, so the bartender was playing the most punishing death metal imaginable at the loudest possible volume. We couldn't even have a conversation. It seemed ridiculous to just be sitting there holding our bottles of High Life, so during a merciful moment of silence I told her, "The next song that comes on is our song." Right then Dethklok's "I Ejaculate Fire" came on, and we almost fell off our barstools laughing. That was just a joke, though. "All The World Is Green" was no joke. It was almost like a weapon, a way to remind each other how deep we had gotten, and if the other one ever shied away for even a moment it was a sharp reminder. "See? We are tied together." The first time I remember hearing it together we weren't even together. We were at the same party, but it was inappropriate for me and her to be together, it being so uncomfortably close to her time with a good friend of mine. We had both made mistakes and were cowardly about it, so we decided to pretend not to know one another in public, which like, pretending to work, is one of the more exhausting and pointless things you can do with your time. At one point that night she left and she made it clear she wanted me to wait at the party for her. I felt like I was caught in a film noir. I was falling in love with the wrong woman for the wrong reasons, but it never crossed my mind to walk away from that party. I waited for her in the living room with a guy whose name I never learned and who I wouldn't recognize if he introduced himself to me right now. Tom Waits was on the CD player and that song came on. "Of course," I thought, because the song seemed to sum up everything about me and Rachel. When it finished I went over to the stereo and hit repeat. I kept repeating it over and over again while I waited in that living room. Eventually I looked over at the guy and said, "Sorry, I need to keep hearing this song." He was transfixed in his own way. "No," he said. "It's great." I was reminded of the old house on Emerson I lived in with Amanda, back when we were still married. We originally shared it with a bunch of painters. I'd come home late at night and Lesli would be painting. Painters are always trying to freeze a moment in time, and one time I came home and she had Jeff Buckley's version of "Hallelujah" on repeat. This was before it was a popular song to cover for singing competitions, if you can imagine such a time. I sat down on the couch and heard "Hallelujah" over and over again and couldn't move because it pinned me down. I had never in my life listened to a song more than once in a row, I had never even considered the possibility, but for Lesli it was basically a part of the painting process. It doesn't matter how many times I listened to "All The World Is Green" in that living room, waiting for Rachel to return. Fifteen, twenty, fifty—when she came back things were never the same. We ended up walking all the way from Northwest to Southeast Portland as the sun rose. Her eyes dulled as the night wore off. The world was getting darker, all her optimism seeping out just as the sun was coming up. On the Burnside Bridge she started to panic. Everything was falling apart in her mind and all I could think to do was remind her that it was just chemicals in her brain. No matter if we were escaping a party in her '61 Valiant or we were walking on opposite sides of the reflecting pool in front of the Lincoln Memorial, all the world was green. The song always came up on a mix, or an iPod on shuffle, or just in our heads, always at the perfect moment. The two of us always dressed in black, as though we were in mourning for the mistakes that we made. Even when we were in Buenos Aires in the summertime, it was always black. One day when we were there we ducked into an old church where a choir was singing songs that echoed in the rafters. The plaster was in disrepair and falling down in white flakes. Every few seconds another tiny piece would fall on us. And each time, we would turn to each other with a look of, "Are you crying?" "No, just plaster. Are you crying?" "Plaster." Piece by piece this wonderful church in San Telmo was crumbling. How much can a ceiling fall apart until you can't live under it anymore? We stayed for one more song and then walked out, brushing the dust off our clothes. One day Rachel showed me a new tattoo she had gotten on her arm of an anchor and some waves. She said it was partly because she was born in Anchorage, but it was also because of the line in that song that I had quoted to her once, "Marie, you are the wild blue sea." This was who she was, she told me, the wild blue sea. I didn't say anything, but I realized that I had misquoted the words to her, the actual phrase being "wild blue sky." As soon as people started picking unripe tomatoes and shipping them far away, they should've been called something else, but it's hard to send back your plate of shadows and ask for real tomatoes. A large part of my struggle with Rachel was that I was the first man to ever really say no to her. If I were as beautiful and vibrant as she was, I too would have believed that I never needed to spend a night alone if I didn't want to. I admire that confidence. It's the only way to really get what you want in the world. After Rachel and I finally split, any time I would hang out with a woman, I found myself missing our struggle. At dinner I'd keep waiting for the one word I'd say that would lead to the big argument. It never came. We would just eat our pad thai and then go watch a movie. Maybe the women I met after Rachel were afraid to push me because they didn't want to push me away. Or they didn't feel they deserved the absolute best that the world had to offer. Maybe they were just content to have normal, quiet evenings. On those evenings I felt like we were just making shadow puppets, content to recognize shapes that represented things we'd heard about. Years later, after Rachel had moved to Australia and gotten married, she asked me if I would play a show for her when she was back in Portland at the end of the summer. She said she'd really love to get to listen to me in a quiet space, so I set up a show at a small bar called Savoy. As it turned out, this was the only time all her friends were in one place, catching up, which meant it was a night of people talking through my entire set. It felt pointless. I had just played a dozen shows on tour in the Midwest to quiet respectful audiences and here in my hometown I was tearing up my voice trying to sing over the noise of the crowd. She talked and laughed with all her friends, who were also my friends, but were really her friends. I played "All The World Is Green" that night, but I honestly don't even know if she could hear me. Nick Jaina is a musician and writer from Portland. He has released several albums over the last decade under his own name, including 2013's Primary Perception on Fluff and Gravy Records and 2010's A Bird in the Opera House on Hush Records. He is a cofounder and musical director of the Satellite Ballet and Collective in New York City. He has composed music for ballets and contemporary dances with that group, featuring dancers from the New York City Ballet and Juilliard. Get It While You Can, his first book, was published in 2015 by Portland-based Perfect Day Publishing. This essay is excerpted from the book by permission of Perfect Day Publishing. Cover photo by Ben Cadet.